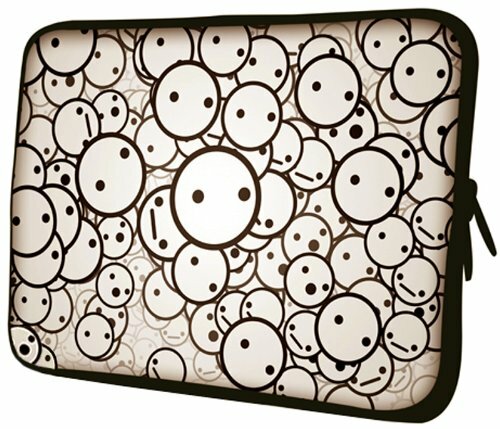 If you love bubbles or those face emotion expressions you'll love this 14 inch laptop computer carrying case! Both sides of this lightweight, flexible notebook laptop sleeve are printed with the black, white and beige color. Because it's made from cushioned, water-resistant neoprene, your computer will be protected from weather elements or spills and also bumps and dings. A soft interior protects from scratches while dual zippers protect your computer from slipping out and allow for fast and easy access. Carry it as is with the comfortable handle or slip it into your briefcase or backpack. Slim fit notebook pouch case will easily slip into your briefcase, messenger bag or backpack. Either way you'll be traveling with fun, style and great protection all rolled up in one notebook slip case. * Due to monitor variations colors may appear slightly different.